Annisa Gobrowski is a New Jersey transplant in Florida, a very blonde Florida. She has a problem- she is the one of the only brunette girls in her entire school. At least two people make her feel welcome, Bethany a cynical teen, who just happens to also be a brunette, and Daniel her uberhot neighbor, who just happens to be a popular football-wrestling-track star, and secret guitar-player. After Annisa breaks the most popular girl in school's nosein a disatorous first day, it seems as if it can't get worse.Though Bethany objects, the fact that Annisa is a brunette is not going to stop her from trying out for the cheerleading squad at Sand Dune High when two girls get kicked off the team. And who would have guessed that the girl who's nose Annisa broke would be the cheer captain, but despite all of this she makes the squad. Follow Annisa as she tries to survive as a non-blonde cheerleader. I didn't really know what to expect from this book. 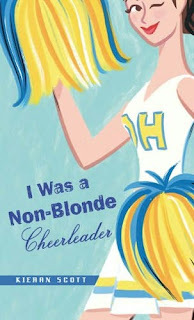 It looked good, but a book about a cheerleader, in Florida? It just seemed a bit to perky and like fluff to me. And I was partially right, but that didn't stop me from liking it. Annisa is very perky, but the thing is many of her fellow cheerleaders are not.The team is falling apart, and the typical stereotype of cheerleaders being popular is held, but not the cheerleaders being stupid. Annisa's character shows that it is possible to maintain who you are even when you are being pressured to change. And a plus, there is a bit of romance! I also have new respect for the sport of cheerleading, seeing how hard and dangerous cheerleading can be. The characters were great, I loved Annisa's brother Gabe who has been described as a chameleon because of how often he changes his look. It's not a book you want to read if you're looking for a serious, but if you're looking for a quick and fun read this the perfect book for that. If I were to use a star rating, it would be between 3 3/4 and 4 stars out of 5. Okay, this isn't a normal review, I'm just gonna say that these are great books. If you had talked to me about four months ago I would have told you I would never read Twilight and sequels and when I orginally told my friend I would go see the movie with her it was to get her off my back about watching it. Then, I decided I would read the book if I liked the movie, and then I realized I didn't want to become one of those people who watch a movie to decide whether or not to read the book, so that started my search for a copy of the books. But, I didn't have the money to buy it, no library around me had a copy, and my friends were reading their's, so I started with New Moon, then read Breaking Dawn, then Twilight and finally Eclipse. And if you're wondering how I knew what was going on, I admit I read the book summaries on Wikipedia. So, just to say I still like Harry Potter better, J.K Rowling is a better writer is some ways and I loved the world she created, but I also loved Twilight. So this reccomendation is coming from someone who said she would never read the books and only decided to read them because she promised a friend she would see the movie, then they must be good. So if you are like I was, I would get over yourself and read them. They are not perfect, but they are a great and exciting love story. 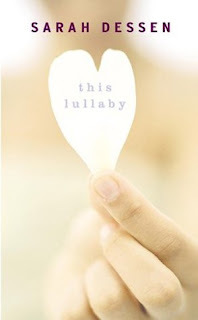 This Lullaby by Sarah Dessen. I absolutely loved this book!! The characters are great and seem real, and Dexter and his band are hilarious. I wish the book had gone farther, because I wanted to see what happened. So if and when you read this, be prepared for songs about potatoes and diet cokes that manage to hit people perfectly on the head! Audrey, Wait! by Robin Benway, is a book that came out a little while ago, but I couldn't force myself to buy it because it was a hardcover. I finally got it this fall and I finished reading it ages ago, but I lent the book out and still have yet to get it back (so, therefore have been unable to do the summary) and then I decided that I should review it anyway. Before I start though, my heart goes out to any people who still have power out from the ice storm (or who just got it back), and hope that you are staying warm (or stayed warm). Audrey, a pretty typical music loving teen, breaks up with her self-involved boyfriend Evan, who happens to be the lead singer of a band called the Do-Gooders. Upset about the breakup, Evan writes a song called Audrey, Wait! which becomes a hit and skyrockets up the billboard charts, and now everyone wants to know the girl who inspired this hit song. And all Audrey wants is to be able to hang out with her friends and maybe get some peace and quiet with her new crush, which of course is impossible when you are getting mobbed by paparazzi. So follow Audrey as she navigates this fame, and enjoy the book. So, I gave this book to my friends to read after I read it and loved it. And I got reports back that it was a bit slow moving in the beginning. I hadn't even really noticed, but they were somewhat right. But the beginning is just to getting to know the background, and soon the book picks up and personally, I had trouble putting it down. So I say read it, and just know that the beginning is slow, but the rest is not. Sloppy First by Megan Mccafferty is about a hyper-observent teen trying to survive high school without her best friend Hope. Hope has just moved to Tennessee after her brother's overdose when we meet Jessica Darling. Jessica is a track star, with a crush to end all crushes on the senior captain who doesn't even know she's alive. And Scotty, her first boyfriend of 11 days in eighth grade, still likes her, and everyone thinks she should so totally go out with him. And to make things worse, her sister Bethany is getting married, and her mother is in wedding overdrive. As she writes about life, love (or lack there of) and poseurs, you find yourself laughing along with Jessica and feeling her sorrows. This book is extremely funny and a must read for teens. Also check out the rest of the series: Second Helpings, Charming Thirds and Fourth Comings. Perfect Fifths, the final book in the series, is coming out in April. Hey everyone, sorry it took so long to get this up! More reviews to come I promise!!!!! Well, the summer before I started high school, I filled a loose-leafnotebook with the tale of a geeky girl who wanted to find a prom date,so I guess you could say I always had some book dreams. But after I started writing for magazines, I could hardly process anything over 1,000 words, so writing a book seemed daunting. I honestly think it was the ElleGirl audience who inspired me: They were such smart, funny girls, and I got to the point where I wanted to write more for them. What inspired the Violet Series? My time at ElleGirl especially gave me insight into the fashion world and how newer models live in NYC (which can be glamorous, scary,thrilling, and a little dark all at the same time). That knowledge kind of overlapped with my long-time dream of writing a teen novelabout a small town girl in the big city (original, right?). The fashion world thing gave it more focus and helped me nail down theplot. Were any of the characters from the Violet Series based off real people? Lots of Violets likes and dislikes are my own. And I might have known a guy like Kurt in college (he's in Violet in Private). But therest--truly--are combinations of people I've known and pure imagination. 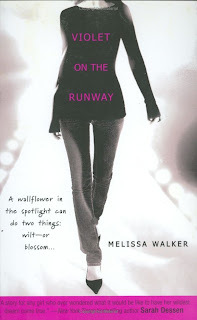 The books are based around the fashion industry, and are pretty welldescribed, how did you do research for these portions of the books? I spent so much time working at fashion magazines that I had seen a lot by the time I sat down to write, so I just worked with what I knew. That's like asking a mom who her favorite child is! I don't know. I guess I do have a fondness for Roger. What's in the future for Violet? There are just three books at this point, so the future may be inreaders' imaginations. What was your first job as a writer? My first "job" was on my high school yearbook as a Features Writer. But if you mean the first time I got paid for being a writer, that wasat ROSIE magazine, Rosie O'Donnell's short-lived title. I was an editorial assistant and had just moved to NYC--it seemed superglamorous, and I loved every minute! What was your favorite assignment as a journalist? Probably going to Brazil for Sao Paulo Fashion Week--I had a blast andlearned so much about the fashion industry's international side. What do you suggest to girls who want to get into writing? First, you have to read. Read, read, read. You'll learn so much aboutcharacter, plot, pacing, conflict, etc. from reading. Secondly, keep ajournal, something you're not afraid to find your voice in, somethingthat's just for you. It will help you practice your style becauseyou'll write freely--and one day you'll turn back to it for story ideas! And lastly, part of my blog is to get the readers to think about atopic of importance, so if you would like to give the topic for thisweek that would be great! Sure! In Violet in Private, Violet gets a designer to use "green"cosmetics as makeup for a fashion show. In real life, that scene wasinspired by Teens for Safe Cosmetics, a great organization of girlstrying to make sure that makeup is safe and environmentallyresponsible. Check them out: http://www.teensturninggreen.org/about-us/teens-for-safe-cosmetics.html. Thanks Melissa for doing this! And everyone, you should think about checking out that link to the website that Melissa gave, it's really cool! So as said before I am participating in National Novel Writing Month, or NaNo Wrimo, if any of you are I'd love to know! So, I'm working on a bunch of reviews right now and they will be up when I get them done. I will be introducing a new author for the blog soon, more info later. Also I have decided to take part in National Novel Writing Month, it starts Nov. 1 and ends Nov. 30 and in that time I must write a novel. I encourage all of you to look at the website and try it. The website is http://ywp.nanowrimo.org/ Check it out! Sorry this took so long, I finished five new books, so there will be five new reviews coming out. The first one is now! 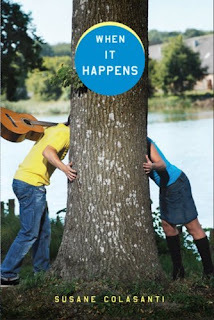 When It Happens by Susane Colasanti is an amazing story about two polar opposite high school seniors who fall in love. Tobey has had a crush on Sarah for a while, but she is a serious student, and he is a mucisian and slacker. He devises a plan to win her over, but Sarah has started to go out with popular jock Dave. Filled with musical references that can appeal to even non-music lovers, this is a teen love story to remember. I could not put this book down, it was one of the better books I have read. 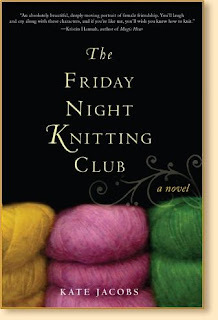 I highly reccomend this book for anyone who likes YA novels. One warning though is that it is written in first-person in alternating perspectives, so there is a warning for those who don't like that. But that was my only problem with the book, I have reread it a few times since I first finished it. So, if you are looking for a good love story, this book is for you. So about the long awaited new review. Sorry I haven't been posting too much, but I ran out of new books to read. Luckily I ordered five new books last night and they should be arriving any day now, so a new review should be up soon. So, for school I have to read a bunch of short stories and one that really stood out to me was "Everyday Use" by Alice Walker. The story tells of a women who has two completely different daughters. Dee, an ambitious girl who seems to be embarrassed by her family and Maggie, who is very self-conscious of her burn scars. Dee, who left home years ago, comes back to visit. The story takes place during her visit. Dee has taken part in a movement seen in the 1970s by African American's where they go back to their African heritage. One of the changes Dee made was by changing her name to Wangero. Her mother tells her that the name Dee has been in the family for a long time, the part the mother leaves out is that she can trace the name back to relatives who lived during the Civil War. Dee seems to value heritage, but overlooks key parts of her history. Read the story, it is quick and really good! I'm sorry I kind of gave away a few parts, but it's hard not to when describing a short story. Where: Historic Mount Vernon Place centered on the 600 block of North Charles Street, 21201. Baltimore, MD. This is a really cool event for any of you who are able to attend. This year it includes 200+ author apperances including Naomi Wolf and Avi! There are a lot of book readings, poetry readings and workshops and cooking demo's from celeberity chefs. Also there are many opporotunities to buy books! And best of all, admission is free! If any of you can go, you should, it is a great event! So, I have noticed that a lot of times the country artists have some of the best emotional songs. Sure, pop artists have written some touching songs, latest being the Jonas Brothers song A Little Bit Longer, but if you listen these songs are written best and performed best by the country artists. Some of my favorites are Traveling Soldier and Not Ready to Make Nice by the Dixie Chicks and my newest favorite is Just a Dream by Carrie Underwood. Not Ready to Make Nice was written after the lead singer of the Dixie Chicks, Natalie Maines made a critical comment about President Bush in 2003. Because many country fans are republicans, she and the rest of the band were harshly critiscized for saying those things. The band was boycotted, their songs were banned from the radio, they even recieved death threats. This song is about this contreversy and saying that even three years later, the song was released in 2006, they are not ready to make nice. Traveling Soldier and Just a Dream are both amazing and touching songs, both would make me cry if I cried about movies, books and music. So, if you haven't heard these songs, find them and listen to them because country artists really have the best emotional songs. So, I am back blogging again. I'll try to get a new review up really soon, but I just wanted to say I am back blogging again which I have said twice now... I hope everyone had a great summer and have fun when school starts again if it hasn't already for you. I also have something for you readers to think about... The Chinese gymnasts ages. My opinion is that they look younger than 14, and that even the other young Chinese athletes do not look that young. And though the Chinese are making it seem as the U.S is targeting them, I guarantee that every other country was thinking the same thing. So leave comments about your opinions, because I want to know what you think, and I love getting comments!!! Okay, I know I said I wouldn't post for awhile, but then I went to a bookstore while visiting Cambridge and saw a new book in a series I love, and I want to share this series with you. 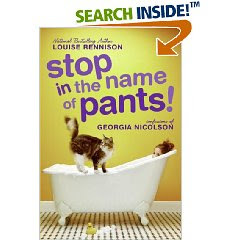 The series is the Georgia Nicolson books. The first one is Angus, Thongs and Full-Frontal Snogging. There are eight books now, the newest being Stop in the Name of Pants. There is also a movie being released this summer called Angus, Thongs and Perfect Snogging. Here is a link to the trailer http://youtube.com/watch?v=ogBjxasdQR0. Here is the books website http://georgianicolson.com/ where you can find a full list of the books, behind the scenes looks at the movie and music from the movie. The books are hilarious, so try them if you haven't! Colin is a child prodigy, or was a child prodigy. Now, he is just a high school graduate with a thing for girls named Katherine. And girls named Katherine have a thing for breaking up with him. Depressed after his break-up with Katherine 19, that's right I said 19, he and his Judge Judy obsessed friend go on a road trip, where Colin comes up with the Theorem of Underlying Katherine Predictability. This theorem would show how long a relationship will last, that is if Colin ever has his eureka! moment and perfects it. This story was okay, it wasn't great. I won't be screaming at you to go get it. I almost stopped reading it at one point because the beginning was a bit slow, but stuck through and it had a great ending. I wish the author had gone on, because I wanted to see what happened. So if it sounds interesting, look it up online because my summary is pretty bad, and get a good summary of it. It was good, just not great. So, that is it, I will post when I can, so check back occasionally, and have a great summer!! So, though it is not quite July 4, I am saying it is. Happy fourth of July!!! I will have a review coming to you shortly, say, July 6, so come check it out. Tell your friends and have them visit the site too! I am trying to get more people viewing my blog, so if you spread the word it would be much appreciated. So the review that is coming is An Abundance of Katherines, so as I said come find it on July 6, because I will post it the night before. Thanks and happy birthday America!!! The Off Season is the touching sequel to Dairy Queen. The book starts shortly after the end of the first. D.J's life is going great. She passed softmore english, she is a true member of the football team, and she sees Brian, all the time. And did I mention the farm is almost broke? And then, in a blink of an eye, D.J's world crashes around her. With one tackle and the tragic injury of Win, D.J's oldest brother, D.J once again has to take all of the family's problems on her shoulders, but can she handle it? This book was a great follow up to Dairy Queen. D.J's character is pretty original, and I like that. She, like her family, is stubborn and does not give up easily. I want to see more of D.J, and all of you should read these books!! God, spelling exercise is really not my thing. I have officially spelled it wrong twice now. Usually, I am a good speller, but I just could not spell exercise. Well, now it is spelled correctly, thank you to google, while I was looking up my blog, it showed the spelling mistake. I am sorry, but it will be awhile before there is a new review. Final exams are upon us, well for those who have finals, and plus I only just got a new book to read. But that doesn't mean stop checking because I will still post. I'd say there should be a new review next week. It would be earlier, but I am gone all weekend. Does anyone have a brain teaser they would like posted? Leave a comment. Catherine stared at me, wide eyed. "You're getting a medal too? You're teen ambassador to the UN and you are getting a medal?" Okay, who will I tag. Yes, I know the riddle was kind of lame, but I didn't have anything else. The answer was a screwdriver. No new brainteaser, cause I don't have one. So, I am back from Disney and school is back in full swing. I came to school today and found out I had a softball game. I have so much work to catch up on, but I thought I would catch up on some reviews. Both amazing books. It is a great read for those interested in the modeling industry and even those who aren't. They are quick reads though, but extremely entertaining. Well, I'm not to big on football, I'm more of a baseball girl, but this book is amazing. Cows, romance and football surprisingly are an amazing mix. Try this book whether you like football or not. Well, I know it has been a while, and right now there is no review, though I have finished a bunch of books. Right now I am on vacation at Disney where my dance studio is dancing on Monday. I went to Hollywood Studios (formerly MGM Studios) and Typhoon Lagoon yesterday. The best part is, I get to do Disney with my friends! Kate's life is completely ruined. Her dad quit his job to sell infomercial vitamins and her best friend is acting like she is invisible. Then Will enters her life. She has known him for a little while, and she likes him. But Will is notorious for hooking up with girls, and when he starts to show interest in her, Kate protects herself by not taking what he says seriously. Even though they make out daily during her breaks from selling vitamins, she still doesn't believe he genuinely likes her. But Will was the only one who cared that her best friend ditched her and he was the only one who didn't make fun of her dad's job. This book is absolutely perfect! Kate is a stubborn, bossy 16 year old whose life was ruined by her father. Will is popular, gorgeous, and completely out of Kate's league- at least she thought so. Elizabeth Scott portrays teenage emotions perfectly. Kate's development in the story was there, but not extreme like in many books. When the book ends Kate's life is still a mess, but it is a much smaller mess. Go to your local bookstore or library and get this book now! And for you who like to read on Google Books, it is not up there! Sam Madison's life couldn't get any worse. She has a C- in German, she got caught drawing celebrity portraits and is now being forced to take art class. She just saved the President from assassination and is now the is the U.S teen ambassador to the U.N. The boy she loves is her sister's boyfriend and the boy who likes her is the presidents son. Really, life couldn't get any worse. This book is very good, but not my favorite. I loved the characters, especially David (the president's son) and Lucy (Sam's older and popular sister). Sam occasionally got on my nerves, especially with some of her top ten lists. Sam was a completely different illustration of an all-American girl. It is a really good book, though slightly annoying at parts. I do recommend it, because as I said it was really good. So, it has been a week since I posted the topic of banning books. I only had ten people vote in the poll, one being myself, but the overwhelming majority was against banning books. One thought that it was ok, and and two thought that they should only be banned in school. I hope that it really provided you with something to think about. My opinion is that that banning books will start to lead to Ray Bradbury's prediction in Fahrenheit 451. It leads to the dumbing down of society and takes away our ability to choose. Just my opinion though. And the new riddle for the is what driver doesn't have a license? Answer in a week. Feel free to post your answer in the comments. 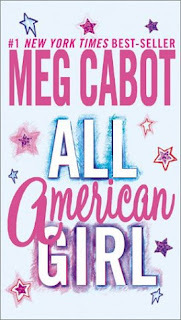 So, I am currently reading All-American Girl by Meg Cabot. I know many have read it, but I will review it anyway, problem is I left it at school! So, I know I said to wait till Monday for the review, but I finished the book. Enjoy! The Assist, by Neil Swidey, follows Charlestown High School basketball coach Jack O'Brien and his players through a three years of their lives. The book focuses on O'Brien, Jason White, or Hood, and Ridely Johnson, though it does follow a few other people. O'Brien is unlike any other coach around. He dedicates himself to the game and to his players. His goal, other than winning, is to help his kids of the streets of Boston, go to college and make a better life for themselves. Unfortunately, his intensity is often misinterpreted, and is disliked among the public. Jason, nicknamed Hood for his appearance, is one of the stars of the Charlestown team. A senior when the book starts, he is co-captain with Ridley. Ridley, known as the nicest kid in school, is extremely talented, but not aggressive enough on the court. The book portrays around three years of their lives, following all the twists and turns of life in the projects. From scholarships to jail time, this book has it all, happy and sad, it shows how some people are determined to get off the streets, and others just sit around waiting for it to happen. I absolutely loved this book. It shows the terrible conditions these kids live in and how it is almost impossible to rise above it. The story was so powerful, and though I usually do not like non-fiction, it has become one of the best books I have read in a while. For those who don't like non-fiction, it is like no other non-fiction book you will ever read. While it is an extremely true story, the writing style that the author chose made it flow like a fictional story. Not to say it sounded fake, but it kept my attention and interest which many non-fiction books can’t do. I was so impressed by this book and I can only sing its praises. 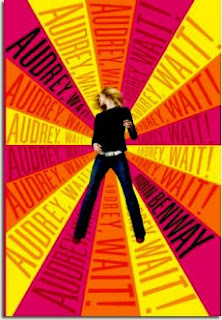 The Page Flipper is having a giveaway for the book Audrey, Wait. 5 will be given away. I haven't read the book yet, but it is supposed to be amazing! Check it out at http://thepageflipper.blogspot.com/2008/04/contest-audrey-wait.html. 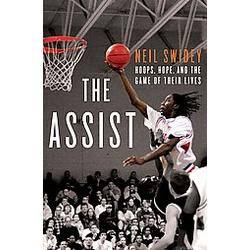 Currently I am trying a non-fiction book called The Assist. More on it when I finish it, but right now it is written so well I forget that I am reading a non-fiction book! I love it and you should try it. I'll try to get a review up soon! I read the book Touching Spirit Bear in English class last year and did not like it. First off I didn't understand it, it dealt with anger and nature, and second there were some parts that were gross, Cole (the main character) ate a mouse and even more disgusting stuff. I'm not going to do a full review because I know many haven't read the first book and I don't want to ruin it. I liked the book, it really helped me understand the first book, I actually liked it better than the first. It is rare that a sequel is better than the first, but this is one of those instances. The Ghost of Spirit Bear comes out June 17 this year! Really, try both books! There is a writing contest going on for girls ages 12-18 Orb 28. Here's the link- http://orb28.blogspot.com/2007/12/call-for-orb28-submissions.html. Last post tonight, I promise! Have any of you read a book for school that you really didn't get, but then you see the movie or read the sequel or something and then get it? 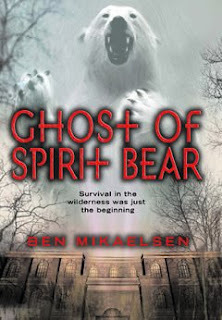 I got an advanced readers edition of the book The Ghost of Spirit Bear, the sequel to the book Touching Spirit Bear, and 12 pages in suddenly understood the first book. A little to late, b/c I didn't do so well on the test on Touching Spirit Bear. Well, now I can say it is a good book b/c I understand it. For those who noticed, yes excercise was spelled wrong in the blog, but the domain is correct because the correct spelling was taken, oh the joys of URLs! I'll try to spell correctly from now on! This week instead of a brain teaser, I'm going to give you something to think about. There is a poll at the bottom, so this question relates to that. I would like you to think about the topic and then respond in comments and/or the poll. Banning books, is it ever okay? I hope this gets your brains working, because it is an interesting topic. I think I mentioned Book Divas before, but I have posted two stories that I am working on called Story of a Girl and Soldier, so if anyone wants to take a look at them, I'm redsoxgirl! So, I figured I should get the first review up quickly, so I got a book at the end of lunch, started it in study hall and finished it by the end of study hall. So right now I'm guessing you know it is a short book, which it is, under 100 pages. So it's review time. When a boy turns 12 years old, he recieves a lawn mower for his birthday, a gift from his eccentric grandmother. When a neighbor sees him riding it and mowing his lawn, he gets hired to mow the neighbors lawn. 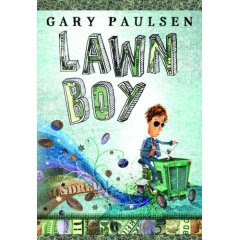 As word starts to get around, he starts to pick up clients, one of them happens to be a stock broker who invests some of the boy's money into stocks. When he has too many clients to handle, he starts to expand and now has a full fledged buisness. This book, though a short read, is filled with humor and a few good lessons on the stock market. In its 80 something pages it is filled with plot twists, that you don't see coming, and some you do. The characters are great, Arnold, the stock broker stuck in the 70's, the boy's eccentric grandmother, and his parents- very smart, but their jobs don't pay well. The book has a happy ending (of course) and there isn't much more I can say. I reccomend it if you want a quick read, but if you want something long and with a lot of meaning don't pick up the book. If you like books, which I hope you do otherwise this blog has no point to you, check out bookdivas.com it is a great place to discuss books and other topics. And yes I know some who are reading this found out about my blog through it, but for those who didn't, check it out. So, the title says it all. This blog is all about books and exercising your mind. I'll post book reviews as soon as I finish a new book, and once a week I'll post a brain teaser to keep your mind sharp. Mostly this blog is about books, which other than baseball, is my favorite way to spend time. No brain teaser today b/c I am tired and don't feel like finding one!